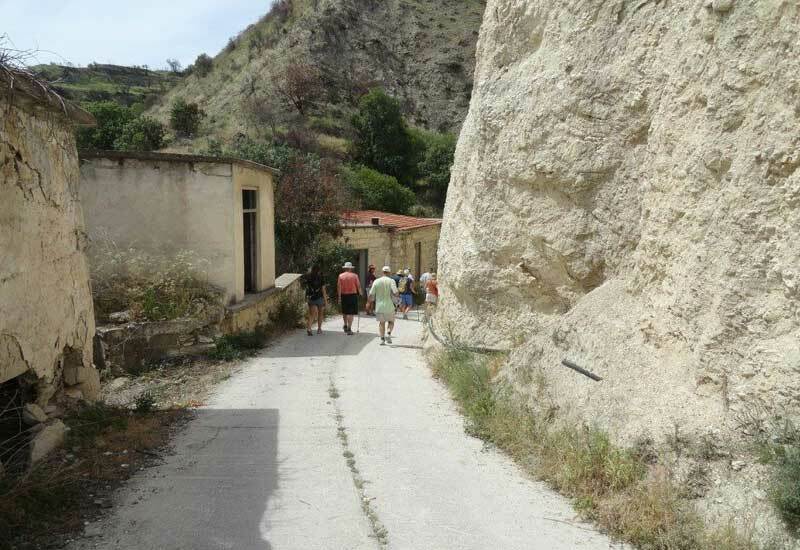 The walk starts from the village of Miliou. At 10.2kms (6.4miles) it uses well-worn tracks to reach old Theletra village, returning to the centre of Miliou via a more interesting and difficult route. As the title suggests this is a long, strenuous walk with stunning views. Parts of the walk have no shade; various tracks are severely rutted and stony underfoot; proper footwear is essential. To reach Miliou use the B7 Paphos to Polis main road. The village is clearly signed in the valley on the north side of Giolou. Drive up to the village centre, now comprehensively paved. Turn right past a memorial, taverna and properties. After about 200 metres park on the right-hand side of the lane where there is ample space. The old property ahead used to be the village school. GPS 34.56N/32.27E. Walk down the steep concrete roadway ahead of you and continue downhill into the valley. At the bottom, on the right, is the Ayii Anargyri Spa centre (0.8km/10mins). Pass this and walk on for another 200 metres to the first right-hand turn where a property stands. Walk with the property on your left until reaching a fork. Go right and descend into the valley; steep and loose underfoot. At the bottom cross the usually dry stream and, bending right, ascend the steep hill which winds left and right. Ignore two distinct right turns and continue uphill with the rock-face on your right. Walk on until you have passed three left turns (2.5kms/45 mins). Take the fourth left turn, staying left at a minor fork ahead. Go directly ahead between old almond and carob trees either side of the narrow track. Descend this steepening track, loose now, to the valley bottom (3.2kms/1hr). Cross the small stream which flows amongst masses of bamboo. After heavy rain it will need fording carefully over the large stones. After another 300 metres it is necessary to cross the same stream again. The track bends right here and the ascent to Theletra begins. In the winter the land along here is dotted with wild cyclamen plants, a pleasure to see and admire but not to pick. 200 metres on there is a sharp left turn, take this and ignore the ‘inviting’ flat track ahead. It is now that the long, winding, loose- underfoot uphill confronts you. Take your time, resting as the hill ascends to admire the terraced fields which are well tended despite the difficulty of the terrain. As you get higher the view improves dramatically to include the far hillsides of Paphos district. The hill is only 0.7km in length but expect to take 20 minutes or so! The reward comes as you meet the ‘old’ Theletra road; a good tarmac surface allows another rest to enjoy the surroundings (4.4kms/1 hr 30mins). If you have never visited the old village take the opportunity now to walk down to your left. (Yes, I’m afraid you will have to return here to continue the walk proper. )The damage to properties is evident; do not be tempted to enter them. Go past the Vrisi, built in 1915, to a right turn just a little way on. This will take you up to the church; a dominant old structure still in use with panoramic views and outside seating to rest before you recommence walking. Return uphill and go past the turning from which you arrived. Continue uphill to take the first right turn by Electric pole no.L3-36-21-8 (5.1kms/1hr 45 mins). This track bends left, hugging the hillside to a U-turn round the gully head and, ignoring a left fork at 6.3kms/2hrs, continue around the escarpment passing a prominent limestone outcrop on your right and fabulous views across towards Troodos. Your heading is north to northwest now. About 400 metres after the outcrop ignore a right turns into fields and continue ahead; bearing left. After a further 0.5km the main track goes sharply right downhill on a VERY loose surface with eroded rocks too. This downhill section winds for 200+ metres to the valley bottom (7.4kms/2hrs20mins). The uphill before you is steep and, again, loose and rocky. It’s called ‘The 500 step hill’ as an aid to spur people on! Reaching the top at a crossroads (7.8kms/2hrs35mins) take time to catch your breath and admire distant views including Miliou ahead, off to your right. Go straight over and start the downhill descent on concrete, winding left and right to take in two sharp left bends within the next km (8.8km/ 2hr.45mins). On your right is a huge property surrounded by walls. Continue down, ignoring its entrance driveway and, staying left to avoid going down into the gorge, pass water tanks on the left. Walk on down as the road meanders left and right. By now Miliou village fills the view ahead of you. A further 1km on (9.8kms/2hrs.55mins), take a left turn among houses to bring you to the village centre. Walk across, past the taverna, to your vehicle (10.2kms/3hrs).